(June 6, 2014) A mind-boggling new twist on the road to urbanization. 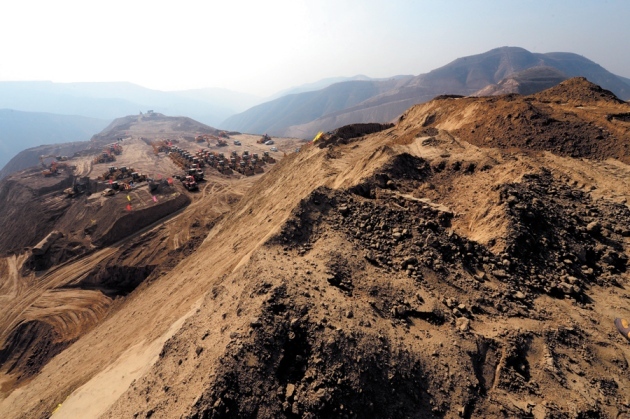 In Lanzhou, China, 700 mountains are being levelled to create more than 250 square kilometres of flat land. Imaginechina/Corbis. In a paper published this week by the journal Nature, Chinese scholars warn that the consequences of the country’s latest geoengineering jaw-dropper — moving mountains to fill in valleys for land creation — are unknown and have never been carried out on the scale currently underway in China, where dozens of mountain peaks are being bulldozed over hundreds of kilometres for urban construction. They point to the air and water pollution problems that are already the result of these projects, along with soil erosion, geological hazards such as subsidence, altered groundwater flows, deforestation, farmland destruction and the loss of habitats for wild animals, birds and plants. For example, the 100-billion (US$16 billion) total cost of the Yuan project over 10 years could take another decade or more for the ground base of mountain infill to become stable enough for construction. The lengthy payback period will deter investors and increase the economic risk of the undertaking — a warning signal to officials that is drowned out by the lure of sales from land, a driver of local GDP growth. Such growth has for some time been the yardstick (despite warnings) used by China’s central administration to assess the success of local governments, which has led to over-spending by ambitious local officials on infrastructure for expected profits not recouped by revenues. Read the paper by Peiyue Li, Hui Qian and Jianhua Wu published by the journal Nature here.